Prick potatoes with a fork and rub with butter. Place on a baking sheet and bake until done (±1 hour). Cut the potatoes horizontally and hollow. Mash the cut out potato pieces and mix with the cheese. Mix in with the cooked bacon and mushroom pieces. Divide and spoon the mixture into the potato cavities. Return to oven and reduce to 100ºC. 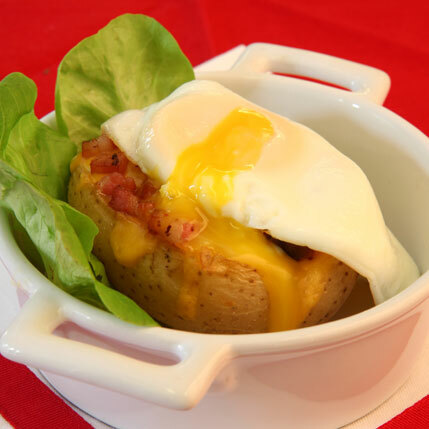 Top potatoes with poached eggs and serve on fresh salad leaves. Left overs can be used as potato filling.